We’d love your help. Let us know what’s wrong with this preview of Moto and Me by Suzi Eszterhas. Moto and Me tells the firsthand story of wildlife photographer Suzi Eszterhas’s care for an orphaned baby serval—a small, spotted wildcat—in Kenya. When a grass fire separates the serval from his family, a ranger asks Suzi, who is living in a bush camp and is skilled with animals, to be the serval’s foster mom. The book chronicles Suzi’s tender care of Moto, including how s Moto and Me tells the firsthand story of wildlife photographer Suzi Eszterhas’s care for an orphaned baby serval—a small, spotted wildcat—in Kenya. When a grass fire separates the serval from his family, a ranger asks Suzi, who is living in a bush camp and is skilled with animals, to be the serval’s foster mom. To ask other readers questions about Moto and Me, please sign up. This is one of the best animal books I've read in a long time. It's a wonderful story about a serval (Moto) in the wild, who needs help. Beautifully written and full of photos, this is a perfect read for elementary children. I loved it and would recommend it to anyone! This book took me back to my childhood of imagining I was an adult, living in an exotic place, with exotic animals as my pets/friends. The author lived it folks! And because she's a wildlife photographer, the pictures in this book are adorable and gorgeous. I could seriously be happy with a book of just her pictures from her time in Africa. I wish there were some other pictures of what she described too, not just of Moto, but the pictures of him were great, so no huge complaints here. The wordin This book took me back to my childhood of imagining I was an adult, living in an exotic place, with exotic animals as my pets/friends. The wording was a little on the simple side, but the target audience is younger readers, so it makes sense and isn't insulting to them or older readers. I highly recommend this book for the budding animal lover you know, especially if they like the cat family. My inner little girl is jumping up and down, squealing and clapping her hands right now. 5 animal loving stars all the way! 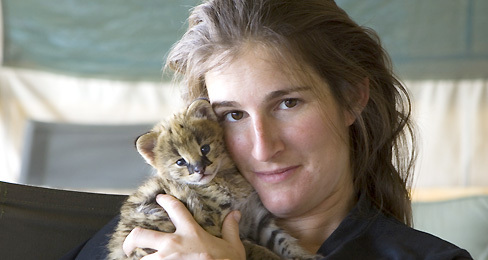 As a detailed (and in fact absolutely true) picture book description of how wildlife photographer Suzi Eszterhas (who is also the author of Moto and Me) acts as foster mother to an orphaned Serval kitten (and how she specifically and with meticulous, precise care raises young Moto NOT to be a human habituated pet, but an adult wildcat to be rereleased back into the Masai Mara, a wildlife reserve in Kenya, once he does no longer require care and nurturing), Moto and Me has proven both enjoyable a As a detailed (and in fact absolutely true) picture book description of how wildlife photographer Suzi Eszterhas (who is also the author of Moto and Me) acts as foster mother to an orphaned Serval kitten (and how she specifically and with meticulous, precise care raises young Moto NOT to be a human habituated pet, but an adult wildcat to be rereleased back into the Masai Mara, a wildlife reserve in Kenya, once he does no longer require care and nurturing), Moto and Me has proven both enjoyable and enlightening, with especially the many important steps the author takes to adequately care for and be a suitable substitute mother and nurturer to Moto, whilst also refraining from making a tame pet or pseudo-pet out of this little Serval first and foremost (and most essentially) demonstrating, presenting what fostering wild baby animals actually means, what it entails, and what is necessary, what is required for success (and Suzi Eszterhas' accompanying photographs, they are of course an added pleasure and treasure, often simply too sweet and expressive for words, providing the pictorial icing on a narratively, textually already majorly delicious piece of cake). Now, if were to rate Moto and Me simply and primarily with regard to the loving and endearingly sweet, descriptive presentation of Moto's fostering by Ms. Eszterhas, his life under her care and succor (how he develops from a frail and frightened orphaned Serval kitten into an adult Serval able to venture into the wild and take care of himself and successfully hunt), I would most likely be ranking this book with four or five stars. However, there are two niggling but personally frustrating and annoying little issues that do prevent me from rating Moto and Me with more than three stars (although I still most highly recommend it). For one, I think that the author, that Suzi Eszterhas, does not in any way provide and give an ample amount of criticism of the tourists on safari who "rescue" Moto, for if the occupants of the car (the tourists and their driver) had simply turned off the vehicle's engine and lights and waited in complete silence for a while, Moto's mother might likely (perhaps) have come back to retrieve her kitten. I know that the tourists are in all likihood and honestly trying to help little Moto, but both they and their driver should have realised that the mother Serval is probably hiding and waiting nearby to collect Moto once it is again safe. And considering that every year, countless baby animals are made into orphans, are abadoned by their mothers because well meaning but ulitmately clueless and woefuly uninformed humans irresponsibly interfere, the fact that the two tourists (as well as the driver) who come upon Moto on that road, almost immediately collect him, instead of taking the time to wait, to watch and check if the mother Serval, if Moto's mother actually returns, actually comes back for him, this rather problematic behaviour should really be a bit more strongly criticised within the narrative, within the text proper. As a kid, I was pretty obsessed with Joy Adamson. I read all of her books over and over for probably a year straight. My mom kept Queen of Shaba: The Story of an African Leopard from me until I had run through the lion & cheetah ones a thousand times, so for a while I got to live in a blissful world where an amazing human wasn't killed by poachers because she loved animals. SIGH. So obviously I am a sucker for abandoned wildlife stories. I also got to kind of live out that fantasy when, at 16 As a kid, I was pretty obsessed with Joy Adamson. I read all of her books over and over for probably a year straight. My mom kept Queen of Shaba: The Story of an African Leopard from me until I had run through the lion & cheetah ones a thousand times, so for a while I got to live in a blissful world where an amazing human wasn't killed by poachers because she loved animals. SIGH. So obviously I am a sucker for abandoned wildlife stories. So Moto and Me ticks off a lot of boxes for me. Adorable teeny abandoned kitten raised by a woman living on a wildlife reserve? Endless pictures of said adorable Serval kitten along with lots of educational information? Yes please. This book is definitely aimed at a young audience (I think it would be perfect to read with a kid), so don't expect a huge depth to the story. The focus is definitely on the nitty gritty of taking care of Moto, which includes cool details like teaching him to fish by putting a catfish in a bowl of water. Side note: if you are squeamish, there are shots of Moto hunting and playing with his prey. Moto and Me: My Year as a Wildcat’s Foster Mom is a completely satisfying story for young animal lovers. Suzi Eszterhas is a photographer at a Kenyan wildlife reserve. She lives in a tent where wild animals roam freely nearby. When a baby serval, a breed of wildcat, is left alone, rangers ask her to be a foster mom and prepare him for an eventual return to the wild. Moto is cute and cuddly, especially at the beginning, but Eszterhas never loses sight of the goal of returning Moto to the wild. The Moto and Me: My Year as a Wildcat’s Foster Mom is a completely satisfying story for young animal lovers. Suzi Eszterhas is a photographer at a Kenyan wildlife reserve. She lives in a tent where wild animals roam freely nearby. When a baby serval, a breed of wildcat, is left alone, rangers ask her to be a foster mom and prepare him for an eventual return to the wild. Moto is cute and cuddly, especially at the beginning, but Eszterhas never loses sight of the goal of returning Moto to the wild. The primary text of Moto and Me involves how Moto became stranded, and the creative ways that Eszterhas balanced being playful and instructive. For a nonfiction semi-scientific book, there is a fair amount of emotion that will touch readers. Moto and Me includes seventeen chapters, each two or three pages in length, so this has a larger scope than many picture books. Third grade is probably the sweet spot for Moto and Me. The masterful photographs are the heart of this book. Baby Moto is irresistible, and as the months go by, we can easily see how he becomes a predator while still maintaining a connection to Eszterhas. Beyond the story of a baby animal and its foster mom, Moto and Me is also instructive about nature conservancy, Kenya, photography, and the developmental process of a wildcat. There was so much that I was thinking about on what this book would be that it greatly surprised me due to the fact that this wasn't another foster mom in the United States. Although there are wonderful animal rescue opportunities and chances that are done by many people around the world it just always seem to be the people of the States or even the United Kingdom who get their stories told. And so it was with a pleasant surprise that I found this story truly taking place where the actual event There was so much that I was thinking about on what this book would be that it greatly surprised me due to the fact that this wasn't another foster mom in the United States. Although there are wonderful animal rescue opportunities and chances that are done by many people around the world it just always seem to be the people of the States or even the United Kingdom who get their stories told. And so it was with a pleasant surprise that I found this story truly taking place where the actual events can occur somewhat naturally. It was tragic in the sense that Moto's tale could have been prevented from happening the way that it did but also a cautionary reminder to many readers that all around us in the natural world there are animals that we find and although some need help others just need us to give them room to make sure things are what they appear and not as they seem. At the same time the reader is given a chance to learn what it was like to be a wildlife photographer living on the savannah and the challenges it was to foster a wild animal at the same time while keeping in mind that the said wild animal was to be returned to the wild as soon as possible. And then to be led gently on that point from one precious milestone to another. I've known about Eszterhas's work since I was a kid from her frequent photographs in "Ranger Rick" magazine, so I was excited to see this book! Her photographs always capture an animal's personality incredibly well and the photos here are no different. Moto is delightfully adorable as a kitten and very regal and proud in his adult pictures. This was a short, heartwarming memoir for kids about her time raising an orphaned serval kitten, Moto. She provides a page for each major milestone in her journey in caring for Moto, from learning what to bottle feed him, to letting him roam free and explore. Eszterhas blends her experiences and facts about servals into the narrative very smoothly and the picture-to-word ratio is excellent. Although it's billed as a kids book, it would make a lovely read for someone of any age who like wildlife and/or cats. Young feline fans will be charmed by this beautifully-photographed story of Moto, a baby serval adopted and raised by a wildlife photographer. When a brushfire separates a serval kitten from his mom and littermates, a wildlife photographer jumps into action, seeing the baby through his formative months until he's ready to live on his own in an African nature preserve. Each large, color photo is more adorable than the next. However, a few shots are shown of Moto hunting and catching mice, which ma Young feline fans will be charmed by this beautifully-photographed story of Moto, a baby serval adopted and raised by a wildlife photographer. Each large, color photo is more adorable than the next. However, a few shots are shown of Moto hunting and catching mice, which may upset very young or sensitive children. Caleb (age 6): "The pictures were adorable. I thought that the story parts really fit together. Moto made my heart melt because he was a cutie. The lady took good care of Moto. She learned that wild cats are very cute and sometimes a little bit destructive. She sent him back into the wild after many adventures including when Moto went into the kitty pouch. That part was very cute." Received via Netgalley in exchange for a fair and unbiased review. I'm going to give you three good reasons why you're going to go buy this book. 1. A portion of the royalties from sales of the book will be donated to the Mara Conservancy to help protect Moto's home. 2. LOOK AT THIS FACE. Now that I've clearly and concisely argued my point. This book is amazing. Told quickly and effectively, as all children's nonfiction needs to be, it's the story of the world's most flippin' adorabl Received via Netgalley in exchange for a fair and unbiased review. This book is amazing. Told quickly and effectively, as all children's nonfiction needs to be, it's the story of the world's most flippin' adorable baby serval, and the year Suzi Eszterhas spent fostering him while taking photographs in the wild in Kenya. The story of Mama Serval having to leave her baby behind is literally like two paragraphs and I was tearing up. I'm so soft. Maybe if I couldn't see the baby face, it would've been easier to handle. I enjoyed this story of the year that Eszterhas spent caring for a wild serval kitten. She received Moto when he was only about 2 weeks old. She fed him from a bottle, cuddled with him and slowly helped prepare him to live in the wild. The best part of the book are the photographs...Eszterhas is a photographer and lived in Africa for 3 years capturing photographs of the animals on the Masai Mara wildlife reserve. Her photos of Moto perfectly capture him as an adorable, cuddly kitten, a young ser I enjoyed this story of the year that Eszterhas spent caring for a wild serval kitten. She received Moto when he was only about 2 weeks old. She fed him from a bottle, cuddled with him and slowly helped prepare him to live in the wild. The best part of the book are the photographs...Eszterhas is a photographer and lived in Africa for 3 years capturing photographs of the animals on the Masai Mara wildlife reserve. Her photos of Moto perfectly capture him as an adorable, cuddly kitten, a young serval learning to hunt and a regal full grown wildcat ready to live on his own. I received a copy of this book from Net Galley for and honest review. Moto! I loved this book, which is more personal than a number of Eszterhas's other lovely animal photography books for children. Moto, whose name means 'fire' in Swahili, is a rescued Serval that Eszterhas fostered for 9 months in the Masai Mara in Kenya. Her wonderful relationship with the Serval kitten is documented in beautiful photographs. Her successful restoration of him to the wild is an important lesson for younger chi I received a copy of this book from Net Galley for and honest review. This is a cute read with beautiful pictures, detailing the author's year of being a foster mom to a Serval kitten. This was especially lovely to me since I have a Savannah, a cat bred from a Serval. It detailed things Servals eat, how they hunt, how the mothers take care of her kittens and many more things. It would make a lovely gift for cat lovers. This is a fascinating and heart-warming story of how author/photographer Suzi Eszterhas, who was living in Kenya, fostered a serval kitten who was separated from his mother at two weeks of age. While she acted as a mother figure to the kitten, she worked hard to encourage his natural instincts and to not turn him into a pet. The little guy thrived under her care while learning the way of all serval wildcats. The photos are beautiful and depict Moto at several different ages. I love this skinny nonfiction book about Suzi Eszterhas, wildlife photographer extraordinaire and author of numerous nonfiction animal books for children, and her experience raising an infant serval, a mid-sized African wildcat. As you'd expect, it's filled with wonderful photos and it's a touching story as well as she raises the serval cub and prepares to release it back to the wild. The author, a wildlife photographer, fosters an orphaned African serval kitten she calls Moto from the time he is 2 weeks old until he is able to survive independently. Beautiful photographs, a fascinating narrative, and an addendum about the serval cats will make this book appealing to animal lovers of all ages. Loved it! Informative and touching. Perfect for primary grade independent readers or for parents or teachers to read aloud. So cute! Great story about a baby serval cat that was rescued and raised by Eszterhas when she lived in Africa. It was released into the wild when it grew up. Heart warming tale. Lovely photos! Very interesting story. I always enjoy reading books about the relationship between a human and an animal. Well written. It kept my attention. 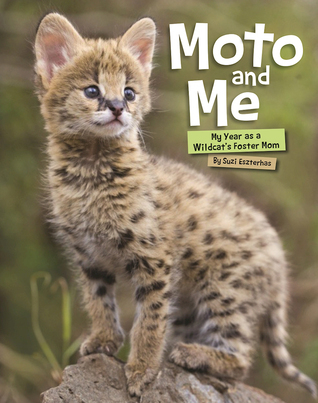 Moto and Me: My Year as a Wildcat's Foster Mom by Suzi Eszterhas is a children's non fiction book. It tells the firsthand story of wildlife photographer Suzi Eszterhas’s care for an orphaned baby serval (a small, spotted wildcat) in Kenya. When a grass fire separates the serval from his family, a ranger asks Suzi, who is living in a bush camp and is skilled with animals, to be the serval’s foster mom. The book chronicles Suzi’s tender care of Moto, including how she feeds, bathes, and plays with Moto and Me: My Year as a Wildcat's Foster Mom by Suzi Eszterhas is a children's non fiction book. It tells the firsthand story of wildlife photographer Suzi Eszterhas’s care for an orphaned baby serval (a small, spotted wildcat) in Kenya. When a grass fire separates the serval from his family, a ranger asks Suzi, who is living in a bush camp and is skilled with animals, to be the serval’s foster mom. The book chronicles Suzi’s tender care of Moto, including how she feeds, bathes, and plays with him, and helps him develop hunting skills. Her goal is to help him learn how to survive on his own in the wild. After 6 months, he is ready to leave—a difficult good-bye, but exactly what Suzi had worked for. Moto and Me is a story that combines emotion and information to nearly perfect effect. I enjoyed reading about the attachment and struggles Suzi faced in balancing the love she had for little Moto with her goal to help him grow up to be able to fend for himself. It was interesting to see how serval are both similar and different from the domestic cats that have always been a part of my life. The photographs of Moto's journey were simply beautiful and the icing on the cake. The information about how servals live, and how we can support the survival of the species was an important bonus. I think that the fact that the proceeds of the books sales going toward protecting the preserve where Moto now lives is a wonderful touch and makes me even more eager to get my hands on a paper (rather than digital) copy. Think a modern Born Free. This is a story I will always love to read. Someone loving nature enough to take a break from their life to help a wild animal to return to the wild. Told in simple to read and follow along text. Young readers can enjoy sharing Suzi's year long adventure teaching Moto how to survive in the wild with their family and friends. The numerous photographs enhance young readers enjoyment of this delightfully fun read. My rating of Moto and Me is 4.5 out of 5 stars. I love non fiction, but I am not much of an animal person. I am drawn, to history, biographies etc...but this one was worth read! I learned a ton about servals, I have no idea what they were. I love the photography and the information is great! I love the back info that talks about getting a I love non fiction, but I am not much of an animal person. I am drawn, to history, biographies etc...but this one was worth read! Wonderfully crafted narrative nonfiction for the primary set. Eszterhas' photographs are scene-stealers and no one will be able to resist the cover photo of the serval kitten Moto or any of the other adorable and heart-melting photos throughout. But this really is more than a collection of wonderful pictures. Eszterhas does a wonderful job of incorporating information into her charming story of fostering and preparing Moto to live a wild life on his own. The text pairs skillfully with an photo i Wonderfully crafted narrative nonfiction for the primary set. Eszterhas' photographs are scene-stealers and no one will be able to resist the cover photo of the serval kitten Moto or any of the other adorable and heart-melting photos throughout. But this really is more than a collection of wonderful pictures. Eszterhas does a wonderful job of incorporating information into her charming story of fostering and preparing Moto to live a wild life on his own. The text pairs skillfully with an photo illustrating what the text is describing, reinforcing the points discussed for younger readers. A wildlife photographer chronicles her year raising a baby serval. Left behind by its mother, the rangers entrusted Eszterhas with the infant cat, and she (under veterinary supervision) raised the kitten to return to the wild. This is the cutest wild baby cat I have ever seen! Oh my! The photographs are perfect, kitten playing, kitten eating, kitten catching mice - when your foster mom's a photographer, you get the best photo ops. The text is perfect too. About 3rd grade and up will find this de A wildlife photographer chronicles her year raising a baby serval. Left behind by its mother, the rangers entrusted Eszterhas with the infant cat, and she (under veterinary supervision) raised the kitten to return to the wild. This is the cutest wild baby cat I have ever seen! Oh my! The photographs are perfect, kitten playing, kitten eating, kitten catching mice - when your foster mom's a photographer, you get the best photo ops. The text is perfect too. About 3rd grade and up will find this delightful - raising a wild animal is difficult and rewarding. Includes an appendix with interesting facts about servals. OMG! How could anyone resist that cover? Author Eszterhas spent three years living in Kenya photographing animals. When an orphaned serval kitten was found, she was given the opportunity to foster the animal with the aim for returning it to the wild. The narrative is simple, straightforward, engaging and interesting. The photographs are amazing -plentiful crisp, clear, full-color photos documenting all the stages of Moto's life with the author/ photographer. Wonderful non-fiction for ages 5-10. Great details, beautiful photography (not surprising as author is a professional wildlife photographer), compelling story. Besides the pictures of the adorable serval Moto, my favorite part was how the author made a pouch in her shirt so she could carry Moto around and have her hands free to take pictures.